The earliest “automatic” fire extinguisher on record is said to have been patented by a British chemist, Ambrose Godfrey, in 1723. It was a wooden cask containing a quantity of liquid and a pewter chamber loaded with gunpowder. When the attached fuses were ignited by a fire, the gunpowder exploded and the solution was released to help put out the fire. On November 7, 1729, Bradley’s Weekly Messenger, a publication, refers to its successful use in stopping a fire in London, England. A box of extinguisher grenades. A more advanced extinguisher was invented by a British Captain, George William Manby, in 1818. Consisting of a three gallon (13.6 litres) copper vessel containing potassium carbonate solution within compressed air. The soda-acid extinguisher that is familiar today, was patented in 1923 by an officer in the Hungarian Fire Brigade, Kornél Szilvay. This new extinguisher took advantage of the reaction between sodium bicarbonate solution and sulphuric acid to explosively propel a stream of liquid onto a fire. Inside the cylinder a vial was suspended containing concentrated sulphuric acid. This vial of acid could be broken in one of two ways: using a plunger to break the acid vial, or releasing a lead bung that held the vial closed. When the acid mixed with the bicarbonate solution, carbon dioxide gas was expelled and the pressurized water was forced out through a nozzle or length of hose. In the early 20th Century, about 1912, the Pyrene company introduced the carbon tetrachloride (CTC) extinguisher. This device expelled the liquid from a brass or chrome container via a hand pump. Two “Harnden’s Grenades”. Very attractive but not very efficient. 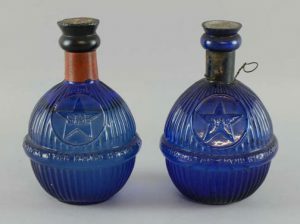 Another variety, known as “grenades” consisted of glass bottles, or “bombs” that were filled with CTC and were intended to be thrown at the base of a fire. Upon contact the CTC vaporized and a chemical reaction extinguished the flames. Though very toxic, this compact extinguisher was found suitable for extinguishing liquid and electrical fires, and was popular in motor vehicles for the next 60 years. A German invention of the 1940’s was a liquid chlorobromomethane (CBM) designed for use in aircraft. More effective, and slightly less toxic than CTC, it was used until 1969.